Oh dear, these were really busy couple of days! I'm back home from the fabulous weekend in the UK where I was a guest teacher at Art from the Heart - and 3 of my new classes - The Artifact, Time Capsule and Beauty and the Beads had the big premiere. As always - it was a bit challenging but I'm so pleased with the final results of the classes and so proud of my talented students - just check out these great projects on my Instagram - huge wow! 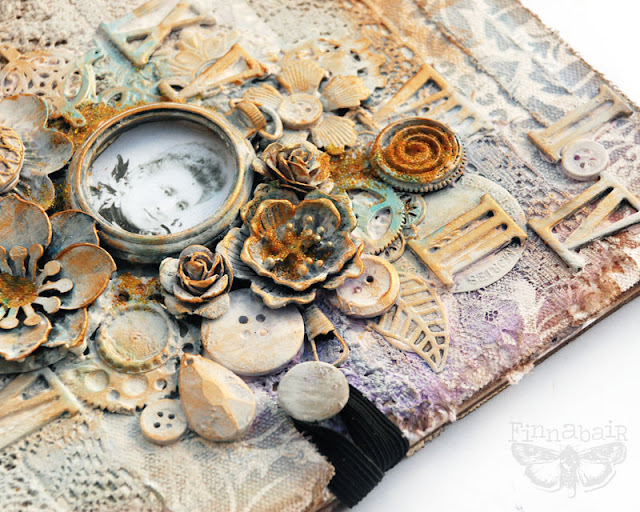 Today I'm sharing sample project I've made in Barcelona - during my classes in Scrap House. 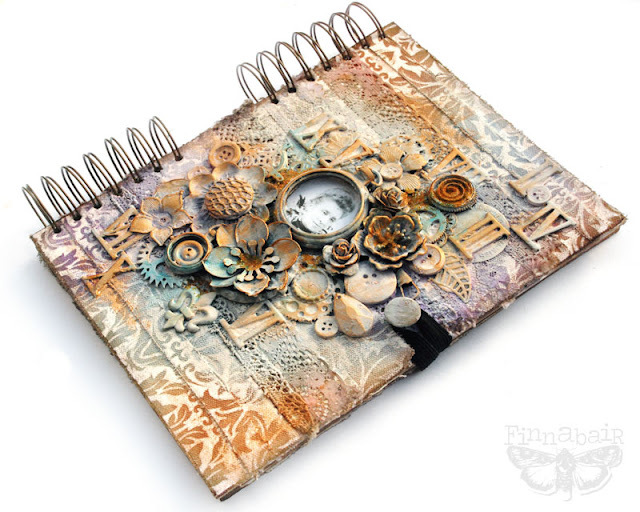 "Frozen in Time" is my new art journal class where in the morning we focus on altering and decorating the cover and in the afternoon we try techniques on the texture and colour overloaded pages! This technique will work beautifully not only on the journal or book cover but also on a canvas - you can create a home decor project featuring family photos or just simply composing inspiring elements - the imagination is the limit! Interested in booking this class? There's still a chance! I hope to see you there - thanks again for your constant support and visiting this little palce in the web. We are here for you! what a fabulous project, it looks amazing... I know everyone who went to your AFTH classes loved them. The cover is stunning, with so much detail - it's a piece of art in its own right. 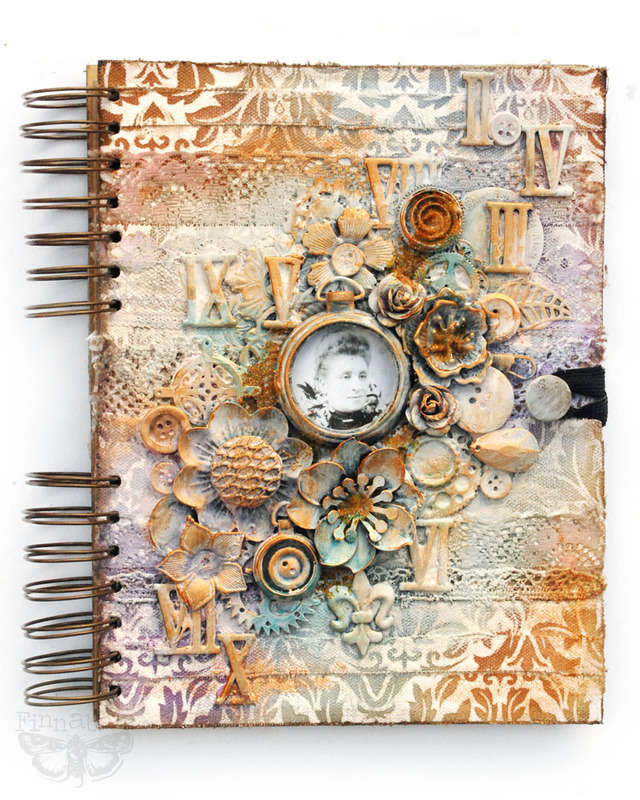 I'm in love with your art journal. It's amazing! 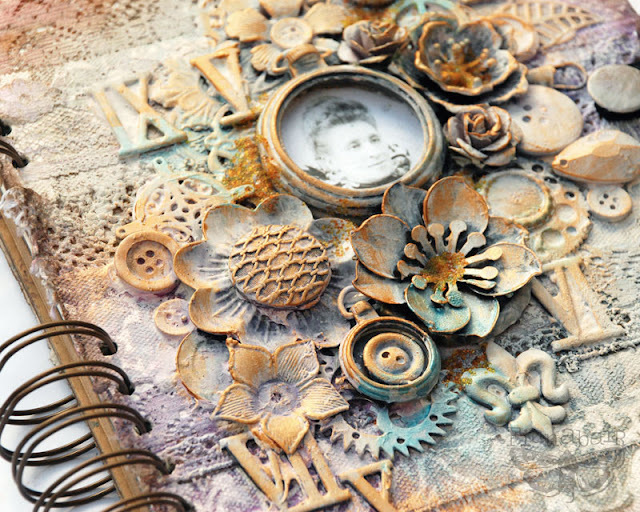 I love the textures, the different styles and the picture in the clock. Ahhhh BEAUTIFUL. As always - just WONDERFUL in every way. Love seeing this - keeps me inspired. Glad you are home but I know you touched a lot of lives in your teachings. Thanks bunches Finn. j.